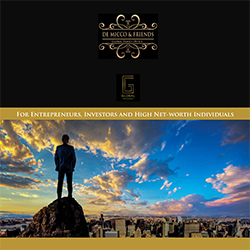 De Micco & Friends offers immigration service for entrepreneurs, investors, high-net-worth individuals and their families in Spain. Local, experienced advisory companies, such as immigration agencies, law or accountant firms, asset managers and family offices can join our group as authorized partners. The idea of becoming a Global Resident through Golden Visa and other programs has gathered a lot of attraction in the last years. Because of the worldwide situation, we expect the demand will multiply in the next years. With this surge in demand, the market needs qualified service providers such as migration consultants, financial and legal advisors, wealth managers, financial advisors, family offices and others who are in the core of our Authorized Global Residency partner network. The Global Residency concept is not only a financial strategy, it's a life philosophy. It involves high understanding of the global migration processes since the relevant factors are weighted after an individual analysis of the benefits and opportunities. To these sophisticated applicants, becoming a Global Resident is not a mere investment transaction and their consultants must be able to understand the complex structure of individual situations, plans and goals. We are looking for the bests! We are not looking for thousands of partners but for experienced advisors with a good network and a qualified client base of local entrepreneurs and high-net-worth individuals in their countries. As an authorized Partner you will be the member of a strong, international lawyers- and consultants network and a very well known brand. Our awarded law and audit firm meanwhile is one of the leading consulting companies in Europe. Our partners get support with newest information and a high quality- client focuses service. Our partners get fact sheets, regulation reports and also marketing support by individual brochures and by support on events and conferences. The authorized partners are listed at our partner site and we recommend them to the local clients. We get daily requests about new partnerships from consultants from all over the world. So we setup a short qualification procedure to assure a consistent level of high quality service by our partners. Just send us your request with further information about your experience, services, client structure and your website by using the contact form. We will support you with further information as soon as possible.